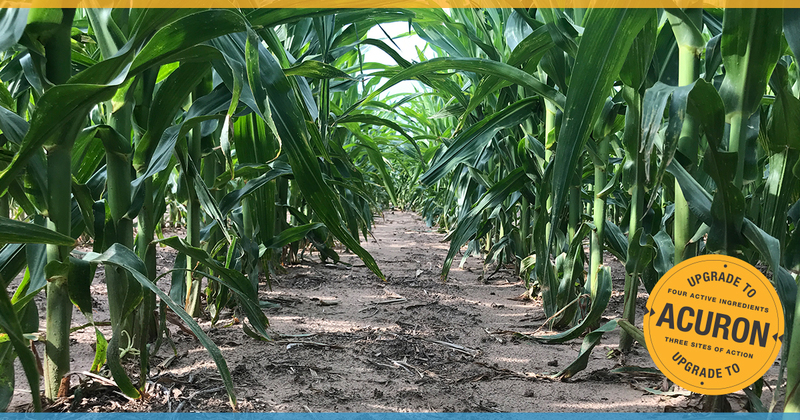 To put you back in control of tough weeds other products are missing, we developed a powerful corn herbicide that delivers more effective and more consistent control of more weeds with a single product than ever before. For years the battle against herbicide resistant weeds had raged. 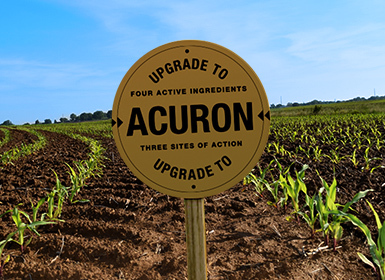 But with the help of a brave young herbicide named Acuron, farmers started to get their revenge. These are their stories. You can enter for a chance to win a Husqvarna® weed trimmer just for completing the experience. Contains four active ingredients and three effective sites of action (Group 5, 15 and 27) for multi-targeted control of the most difficult weeds in corn, including resistant weeds, and built-in weed resistance management. More than 1,000 trials show its unique active ingredient, bicyclopyrone, helps Acuron outperform all competitors, including Corvus®, Resicore®, SureStart®, TripleFLEX® and Verdict® herbicides, and provide greater consistency of control. 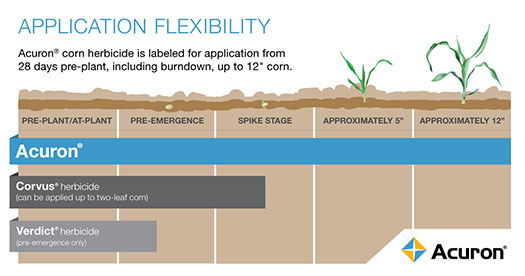 Regardless of weed spectrum, soil type, application preference, tillage system, weather condition, farm size or field location, Acuron will control tough weeds effectively and safely. 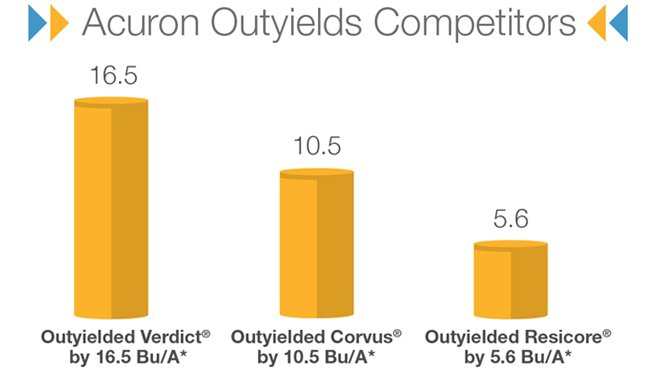 Trials show Acuron protects the crop from yield-robbing weeds better than any other herbicide and out yields other products, putting more bushels in your bin. Enter your zip code below to see for yourself how growers near you upgraded their weed control with Acuron. Still not convinced? 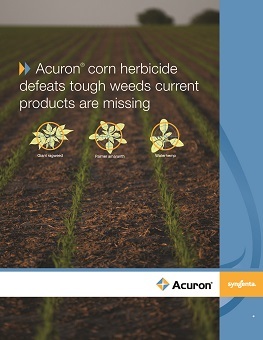 Use our competitor filters to see how Acuron performed against your current corn herbicide. 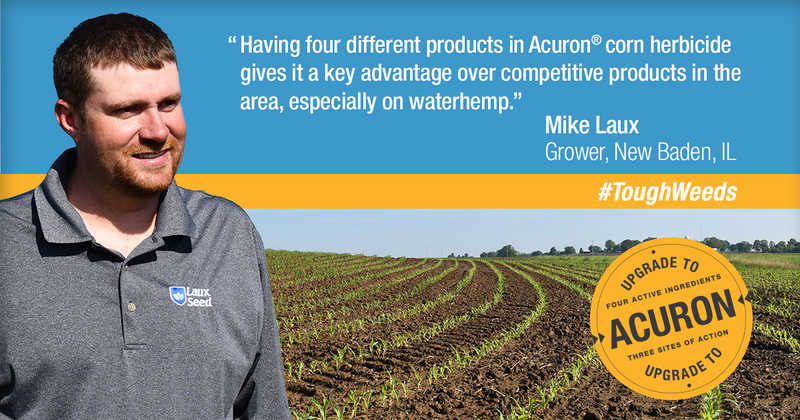 Enter your location to see Acuron performance in a field near you. 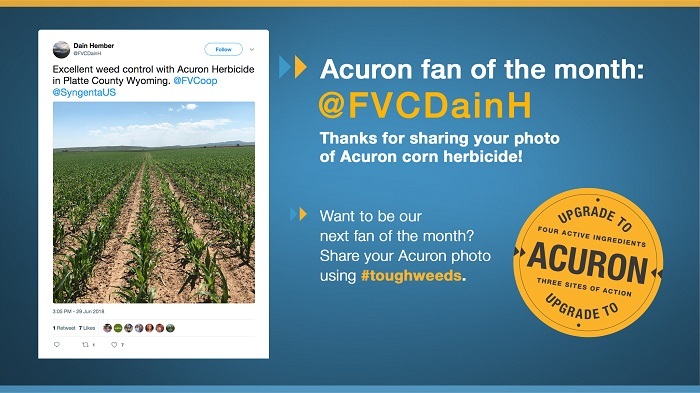 Join the conversation by sharing photos of your Acuron-treated fields using #toughweeds and you could be featured as our Fan of the Month. 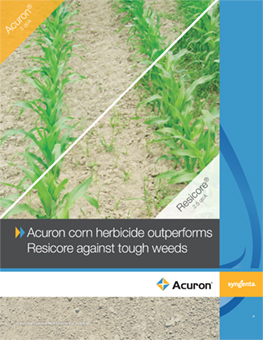 Acuron delivers dramatically improved control and more consistent control of the toughest broadleaf weeds and grasses in corn. The first glyphosate-resistant weed identified in U.S. row crops in 2000, marestail is a dangerous weed. It produces up to 200,000 seeds/plant and grows up to 5-6 feet tall. The seeds are highly mobile, which results in rapid spread. Marestail usually germinates in fall and spring, but can germinate year-round. Waterhemp produces up to 1 million seeds/plant and can grow as much as 1 inch/day. The average height is 4-5 feet tall, with some weeds reaching up to 12-feet tall. The pollen from these weeds can travel ½ a mile or more and because of the cross pollination that occurs, resistance can spread quickly. Palmer amaranth thrives in reduced-, minimum- or no-tillage systems because it germinates close to the soil surface. It can produce 10,000 to 100,000 seeds/plant and has the potential to overtake the crop due to its rapid growth and aggressive competition. Palmer amaranth has prolific seed production and germination throughout the season. It has a faster growth rate and is more competitive than other pigweed species, with growth rates approaching 3 inches/day. When allowed to compete throughout the growing season, Palmer amaranth can create yield losses up to 91% in corn. It can reach 8 feet in height. Once established, morningglory is very difficult to control with post-emergence applications of herbicides. It competes with corn crops for nutrients and has the potential to reduce yield. Morningglory can produce up to 500 seeds/plant, and, due to an extremely hard seed coat, some seeds can remain viable in the soil for more than 50 years. Field research demonstrates that season-long competition from just 2 giant ragweed plants per 110 square feet can reduce corn yield by 13%. Giant ragweed often grows taller than the crop, sometimes up to 5 feet taller. It can produce up to 5,100 seeds per plant. When it comes to the future of your operation, actions speak louder than words. 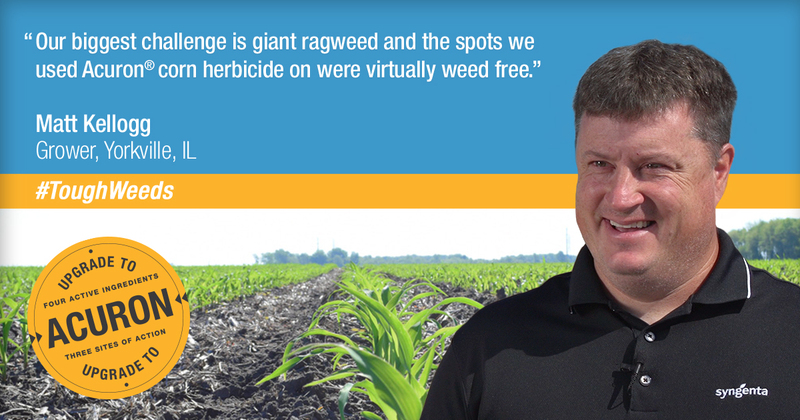 For decades, Syngenta has been collaborating with university experts and conducting research to solve problems associated with resistant weeds. See how our Resistant Fighter program has your back. ©2019 Syngenta. Important: Always read and follow label instructions. Some products may not be registered for sale or use in all states or counties. Please check with your local extension service to ensure registration status. 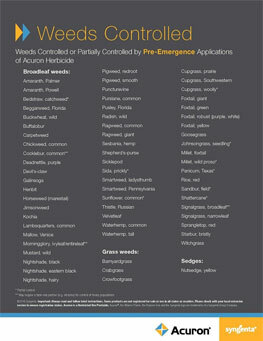 AAtrex 4L, AAtrex Nine-O and Acuron are Restricted Use Pesticides. 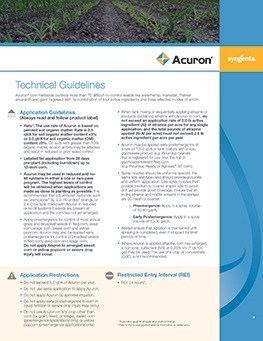 AAtrex®, Acuron®, Nine-O® and the Syngenta logo are trademarks of a Syngenta Group Company. All other trademarks are the property of their respective owners.